You know the drill—you scour every aisle and thoughtfully consider what toy your dog will like best. You pick out what you think is the perfect squeaky duck or oinky pig, but within minutes of presenting it to your dog, you’re picking it off the floor in pieces. There’s a pile of fluff over there, the squeaker somehow made it under the couch, and the culprit—your dog—seems completely satisfied with her crime. Some dogs carry around their toys like precious family heirlooms, but that’s not your dog. Your dog is a destroyer of all things stuffed. She rips apart rubber and even tears her way through rope. Her sole mission in life is to turn your hard-earned money into nothing but scraps of fabric and bits of plastic. It’s frustrating when you can’t keep shelling out big bucks for five minutes’ worth of destruction. So why exactly do dogs destroy their toys? Is there anything you can do about it? Here’s a look into your toy-shredder’s mind. The first time you catch your dog ripping into your shoe or freeing the stuffing from your pillows, you quickly teach her that what she did was naughty. (Hopefully you do it in a way that doesn’t involve yelling or hitting.) You make sure she has plenty of toys, and she soon learns which objects are hers to chew and which are yours to be left alone. This important lesson stops your dog from destroying your house, but it doesn’t solve the underlying problem: she’s bored. While you’re working, talking with friends, standing in line for overpriced coffee, your dog is at home with nothing to do. Eventually, all her pent up energy needs to be released. If she can’t go for a long walk, wrestle with other dogs, or run around the yard chasing you, she’s going to focus that energy in ways she knows she’s allowed. In most cases, her toys take the brunt of that force. She’s not breaking any rules, because she’s allowed to chew on toys. The process of inspecting a plush pig for vulnerabilities, tearing it to shreds, and then appreciating her handiwork is extremely satisfying. Often, it’s her only outlet to express her boredom. Your pretty lapdog with the bow around her collar might not look like a vicious predator, but her instincts say otherwise. Descendant from wolves, today’s domesticated dogs still hold on to their wild ways. Some breeds are more inclined to hunt than others, but at a base level, all dogs are predators. It’s why they chase the neighbor’s cat and stalk squirrels. It could also be why dogs destroy their toys. There are few things more adorable than a little puppy that thinks she’s the toughest mutt on the block. She grabs her plush bunny’s ears and snarls ferociously. Humans can’t help but melt with affection when this happens, and we encourage the behavior because we think it’s hilarious. We growl along with her and act generally pleased with her when she advances to the “chomp and shake” that wolves do when they catch their dinner. Her little puppy teeth are sharp like needles, but her bite force isn’t enough to do much damage…yet. Eventually, that cute little puppy grows up. She’s still adorable, but now she’s capable of causing a lot more destruction. Your dog is also capable of remembering all the little lessons you taught her growing up. She’s a pro at “sit” and “stay,” and she remembers what you taught her about getting ferocious and aggressive with her toys. You laughed and praised her back then, so why wouldn’t you do the same thing now? Playing by yourself is never as much fun as playing with friends. With friends, you can see the cause and effect of each action. The same concept applies to your dog and her toys. 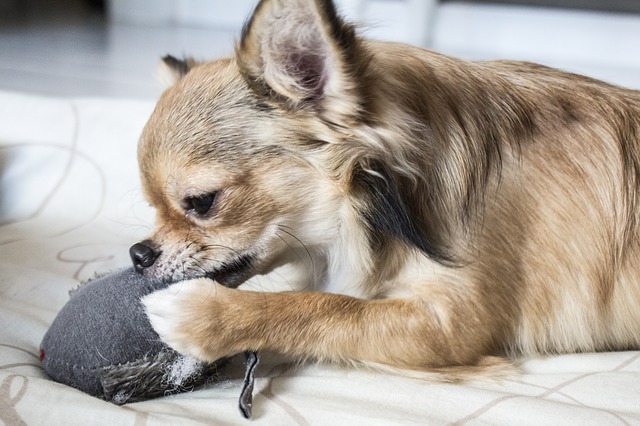 Chewing on something tasteless for the sake of chewing can be satisfying for dogs, but it’s even more satisfying when they can see the effect of their actions. That first little hole she makes after nibbling on a seam is like a battle won. It motivates her to keep going and gives her a goal to work toward. K9 of Mine says a squeak and rip is like a toy “reacting” to your dog’s playing. This type of play is typically more mentally stimulating than playing with an inanimate object that doesn’t change no matter how hard your pup tries. This could explain why even though your dog destroys plush toys, she still prefers them over the hard rubber ones you bring home. She likes the idea that she’s causing something to happen, even if that something means her toy ends up in the trash. Some dogs destroy their toys not on purpose, but because the toy can’t hold up against their regular play. Soft plush toys, for example, are bound to be ripped if your two big dogs like to play tug. The seams will pull apart because of how strong your dogs are, and not because it was their intent. The same goes for flimsy rubber toys and thin rope toys. If you’re buying cheap toys that are poorly made, you can’t blame your dog when it rips to pieces. 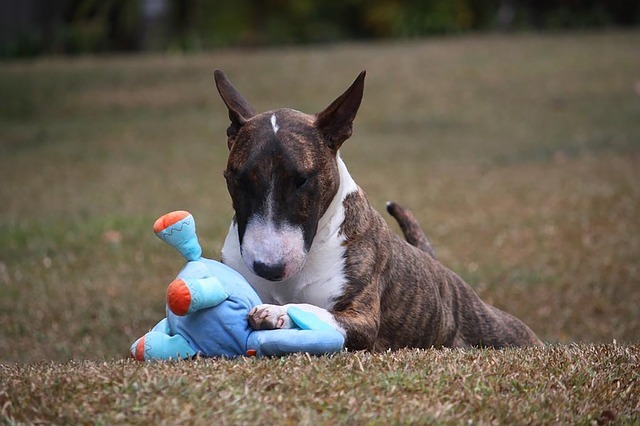 You also need to make sure the toys you buy are appropriate for your pup’s size and breed. You can’t expect a 5-pound Chihuahua and a 120-pound Mastiff to keep the same toys. Bigger, stronger dogs need more durable toys, and yes, that means you’ll have to pay a little more out of pocket. But when you have appropriate toys of a good quality, they’ll last a lot longer than a few minutes. If you’re tired of cleaning up disemboweled toys, try giving your dog more exercise and mental enrichment. When she’s tired and content, she’s less likely to want to destroy things. You can also buy toys that are made of thick, indestructible rubber and seamless soft toys made from thick fabric. There are even toys, like this one from iHeartDogs, that are designed to satisfy a dog’s urge to destroy. Lastly, remember to always supervise your pup’s playtime to prevent choking hazards.